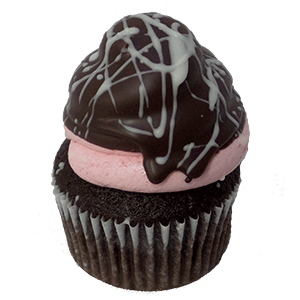 Our delicious Chocolate Covered Strawberry Cupcakes are here just in time for Valentine’s month. Our delicious Chocolate Covered Strawberry Cupcakes are here just in time for Valentine’s month. These cupcakes are chocolate cake with strawberry filling, round tip strawberry buttercream icing (mix straw fill with buttercream) partially dipped in ganache and drizzled with white ganache.